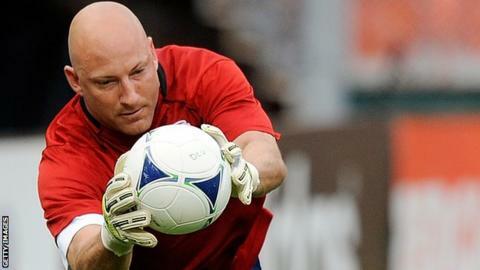 Former Major League Soccer player Matt Reis says his life changed at last year's Boston Marathon. The New England Revolution keeper was yards from the finishing line when two bombs exploded killing three people and injuring 264. Reis, who had his six-year-old son Jacob on his shoulders, was waiting for his wife Nicole to complete the marathon when the first blast occurred. He pauses as he remembers the events of 15 April last year. "It's obviously a day that has changed our lives forever," the 39-year-old said. "For some reason I decided to move, probably about 40 yards closer to the finish line. My brother-in-law followed me. "When the first bomb went off it sounded like a cannon blast. My first instinct was: 'The race isn't over - why are they signalling the end?'" People started running away but Reis rushed back. "I knew the location of the bomb was right by where we were standing and more than likely someone in our group had been injured. "As I got there my father-in-law [John Odom] was on the ground and there was already blood everywhere." Reis knew he had to stop the bleeding. He removed his jacket, applied pressure to the wound and made a tourniquet with his belt. It was an act that would save Odom's life. When the family arrived at the Boston Medical Centre they realised how serious the situation was. Shrapnel had pierced through both of Odom's legs, he had suffered two severed arteries and lost so much blood that his heart stopped beating twice. "The doctors were not sure if he was going to keep his leg, if he was ever going to walk again and what his mental capacity could be, because he did expire on the table for 10 minutes," he admits. "For me the biggest thing was just trying to think positively, not think of the worst, and try to mentally make sure that he pulled through it." Odom was on life support for 10 days, unconscious and in a critical condition for over two weeks, and underwent 11 surgeries. He was the last of the bombing survivors to leave the rehabilitation hospital and is learning to walk again. Reis was playing in his 11th season with the New England Revolution at the time of the bombing and admits he found it tough to focus on football in the aftermath. However, he feels the familiar comfort of the dressing room helped him to return to normality after the traumatic events of 15 April. Reis is a four-time MLS All-Star and a four-time finalist for goalkeeper of the year. Over the course of his 16-year MLS career, Reis appeared in 288 games, making 282 starts. He was on the winning side 110 times, making 1,114 saves and keeping 75 clean sheets. Reis won both the major championships in US professional soccer. He won the MLS Cup in 2002 with LA Galaxy, and the Lamar Hunt US Open Cup with Galaxy in 2001 and New England Revolution in 2007. "Something like this where your life really truly flashes before your eyes, you realise what's important to you," he says. "Soccer is very important to me so being able to get back out on the field and to be around the guys again and to do what I love to do was great." After making his debut for the Los Angeles Galaxy in 1998, Reis went on to play over 250 games for the Revolution and won two caps for the United States. He took time away from the game after the bombings, but returned to the first team in August to help the Revolution to reach their first MLS play-off in four years, keeping seven clean sheets in his 10 games. But his career ended when he suffered a torn left quadricep in the Eastern Conference semi-finals. Reis is now the goalkeeping coach with Los Angeles Galaxy, living closer to his family in southern California. Before matches you can see him wearing a white training top with 'Odom' on the back and the number one. He says his father-in-law's courage has given him great strength - "He's definitely one that's proved you can get beyond a lot of obstacles." He is proud of his own actions that day but after being named the Major League Soccer humanitarian of the year, admits he is uncomfortable with being called a hero. "I think a lot of people acted very heroically that day and you really don't know that much about yourself until you're put into a situation like that. "I like to think that I reacted in the right way [but] there's a lot more better people to call a hero than myself. "I'm just happy we all made it through." John Odom will return to Boston for this year's Marathon on 21 April with his wife Karen and Reis hopes the race and Odom's presence will send a defiant message to those who seek to inflict terror. "I want to show the world that we'll never give up and people that try to do these things to inflict pain and chaos in our world are never going to win," he says.